In the next few weeks, we’ll be sharing a few peeks inside the ShareProgress virtual office. We’ll be talking about the systems, applications and tools we use to keep ShareProgress running smoothly. 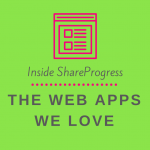 This is our first Inside ShareProgress post. At ShareProgress, we have a small, partially remote staff juggling lots of different needs to keep the organization running smoothly. In order to do that, the ShareProgress team relies on a few different apps to keep all our info synchronized across multiple time zones and state lines. Here’s a quick compilation of what we’re using now–feel free to add suggestions with your team’s favorites in the comments! Asana: Easiest way to create to-do lists both for yourself and for different groups in your organization. You can assign to-do items to others or yourself, add more info in the notes section of the to-do item, and check it off once it’s complete. You can also organize your to-do list into different sections and sub-categories, which helps to keep all your thoughts neat and organized! Groove: This tool works as a helpdesk app for any support questions that come up, and it also serves a double function of providing an alert whenever @ShareProgress (shameless plug!) is mentioned on Twitter. This has obvious benefits for making sure you see any customer service question or concerns ASAP, but it’s also a nice way to ensure that you see folks who are mentioning you to give a compliment or respond to a tweet. Intercom: This is how we do the bulk of communications with our clients. It’s easy to set up auto emails based on specific triggers. For us, events like installing the analytics snippet or running your first A/B test mean that you’ll get a congratulatory email that also walks you through next steps. It’s also easy to route it through your email inbox to make sure you’re not missing any potential client questions even if you’re not checking the app itself. Slack: Most of our team is based in San Francisco, but Andy (our data scientist) and I are both based in the midwest. Slack makes it easy to send quick questions or comments and also makes it simple to upload and share files. Plus, it provides one centralized location for sharing relevant XKCD comics or fun Twitter games. Buffer: I’m starting to keep a close eye on our social media analytics, and Buffer is a great way to get an added boost of analysis that you don’t quite get with Twitter Analytics alone. It’s also useful for scheduling tweets over the weekend, holidays, or other times when my laptop isn’t nearby. Did we miss any of your fav web apps? Are there features on the apps from this list that you rely on that I didn’t mention? Let us know in the comments!